Some of the 50 Cuban medical specialists who arrived in Kenya recently to work in under served rural areas. Supplied. 27 Jun 2018 – Cuban medical missions abroad are perhaps one of the most significant legacies of the 1959 Cuban Revolution. The programme involves Cuban doctors offering health care services in host countries, often in impoverished rural communities where there’s little access. The programme stemmed from Cuba’s foreign policy objectives of anti-colonialism and humanitarianism in the 1960s. It became one way in which Cuba could avoid the isolation intended by the trade embargo imposed by the US and its expulsion from the Organisation of American States (OAS). 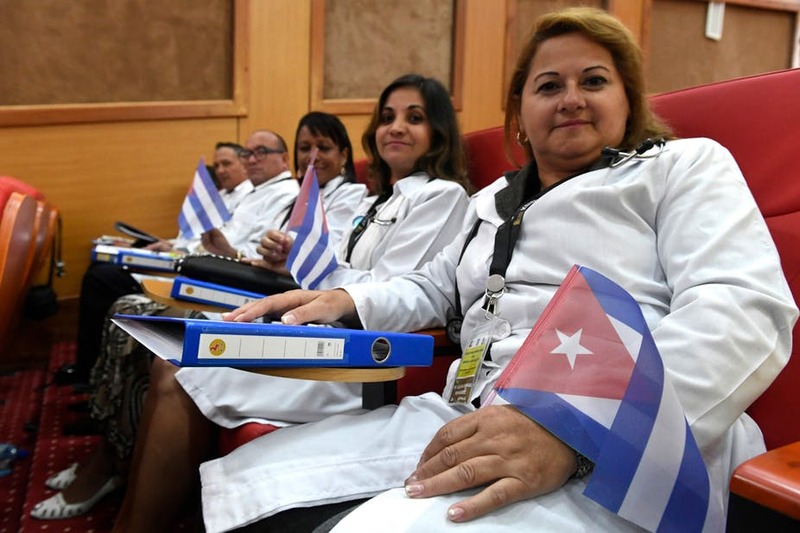 Well over 131,993 Cuban doctors have taken part in international missions in 107 countries. Kenya is the latest. The first 50 specialists arrived in the country recently, with 50 more to follow. All are expected to work in underserved rural areas. But their arrival has been met with a storm of protest. Some Kenyan health professionals have strongly opposed their arrival on the grounds that they’ll be taking away local jobs. My understanding of the work of Cuban doctors has been greatly influenced by the fact that I spent 7 years studying medicine in Cuba, one of thousands of students from all over the globe who have had the opportunity to study medicine on the island. The experience gave me a keen understanding of how the Cuban health system works. It also helped me understand what lies behind the medical missions programme. I accept that the way the programme is implemented in countries like Kenya leaves a lot to be desired. But I would also argue that the services being provided by Cuban doctors is invaluable and the reasons for not wanting them in Kenya are not justified. The current fears of the Kenyan medical fraternity are understandable. But their fears may be based on misinformation. Prior consultations between Kenyan government officials and the medical fraternity would have gone a long way to allaying these. Nevertheless, I believe that Kenyan doctors should focus on the national benefits of the programme. Cuban doctors are sent to rural, under-served areas – areas that local doctors often refuse to work in. In these communities, the mere presence of a doctor can make a tremendous difference in health outcomes. In addition, the Cuban doctors being sent to Kenya are highly specialised in areas such as oncology and nephrology, areas of medicine which are in demand the world over. Their presence can only improve access to specialised medical care while reducing congestion in referral hospitals. Despite a level of economic stagnation, Cuba has managed to maintain a universal health care system viewed as a model for other countries. Current data shows the doctor to patient ratio in Cuba is well above the United Nation’s target of 1:1000, at 7.5:1000 in 2014. By comparison, Kenya has a ratio of 0.204 doctors per 1000 patients. Cuban trained doctors have been praised the world over for the level of service and compassion they offer. There are numerous examples of work that they’ve done. For example, Cuba were sent doctors to South Africa during a brain-drain in the post-apartheid era as white medical doctors left that country in droves. They also helped develop medical faculties in Ghana, Guinea-Bissau, The Gambia and Haiti between 1963-2004. And they showed tremendous humanitarian spirit during the Haitian Earthquake in 2010, the Ebola outbreak of 2014 and even offered the US assistance in the aftermath of Hurricane Katrina. The offer was rejected. The argument that Kenya should invest in its own citizens rather than sign a multi-million dollar deal with the Cuban government is a fair one and should be addressed. But I don’t believe that it’s simply a question of one or the other. Studying medicine is costly and requires training for between six to seven years. This excludes specialisation. But what happens in the interim to sick, impoverished individuals in rural communities while doctors are being trained? Cuban doctors should be seen as a temporary reinforcement offering a level of service every Kenyan should demand. Is a Cuban doctor better than a Kenyan one? No. But Cuban doctors have specific expertise in dealing with tropical diseases such as malaria. This remains a major problem in Kenya even though it was eradicated in Cuba more than three decades ago. It’s also important to keep some perspective when it comes to the numbers. Foreign physicians make up below 10% of all doctors in Kenya. There are 939 foreign doctors in the country’s register – but the majority (358) are from the US. Only 100 are from Cuba. This is a tiny number. The presence of these foreign doctors should be seen as a benefit to the country’s health care service. It offers the opportunity for Kenyan physicians to learn from the Cubans’ experiences working in a universal health care system with emphasis on preventative medicine. They could also learn from their integrated community medicine approach, how they’ve managed to eradicate various diseases as well as policies and guidelines in place in Cuba that could be implemented in Kenya. Cuban physicians will also be able to learn from their Kenyan counterparts how their system operates, difficulties and challenges of working as a physician in Kenya as well as the cultural norms that Cuban physicians would have to consider when offering services to Kenyans. Ultimately, the Kenyan health care system and its people will reap the rewards of the presence of Cuban doctors.